Beautiful pale gold Tussah Silk Blended with Mongolian Cream Cashmere in a 50/50 blend takes dye beautifully and spins like a dream. There is no fixed breed of goat that is biologically named cashmere, but instead in the down that can be found in 68 breeds of goats found in 12 different countries. Most cashmere comes from Asia, particularly China. These goats have a courser outercoat and a fine undercoat, which is the cashmere. A goat only yields about 4 ounces of cashmere per year. This small yield combined with the time intensive process of dehairing it accounts for its high price. Goats are social animals with a normal life span of 10-12 years and a gestation period of 150 days. 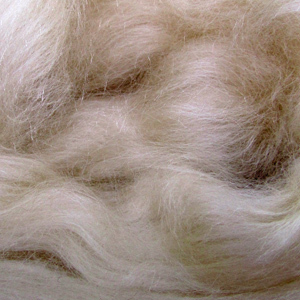 Tussah silk is the product of the tussah worm of India and China, which feeds on oaks. It is now semi-cultivated, as groves of dwarf trees are provided for its feeding.